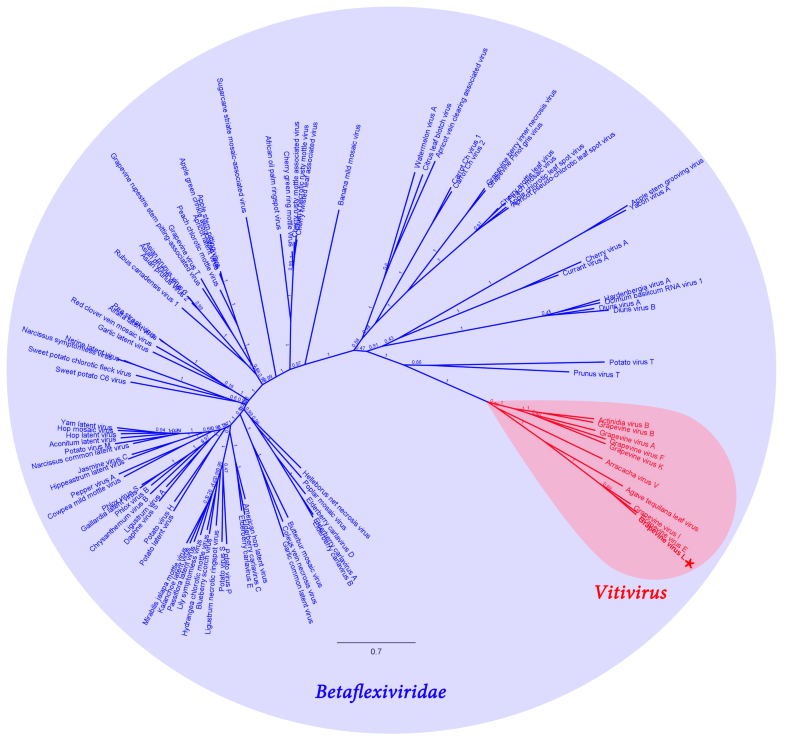 Vitiviruses are ssRNA(+) viruses in the family Betaflexiviridae (subfamily Trivirinae). There are currently 10 ICTV recognized virus species in the genus; nevertheless, the extended use of NGS technologies is rapidly expanding their diversity and official recognition of six more have been proposed recently. 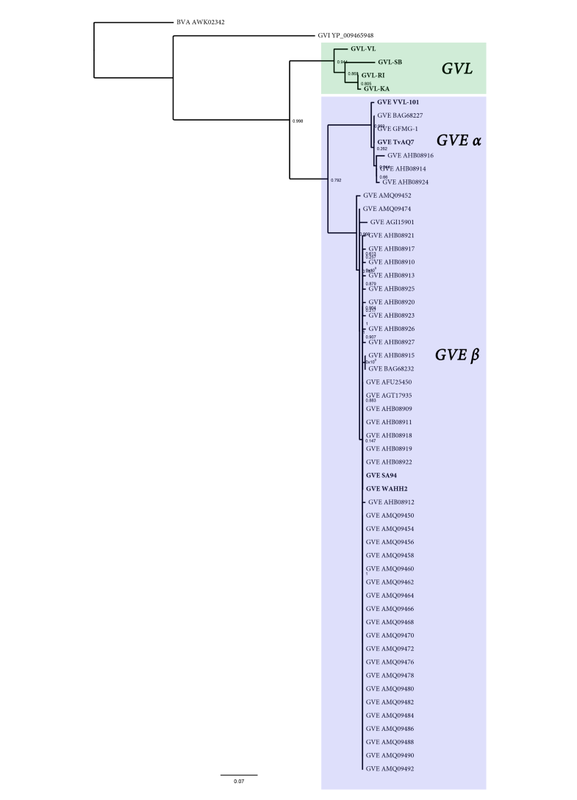 Here, we present the characterization of a novel virus from grapevine, which fits the genomic architecture and evolutionary constraints to be classified within the Vitivirus genus. 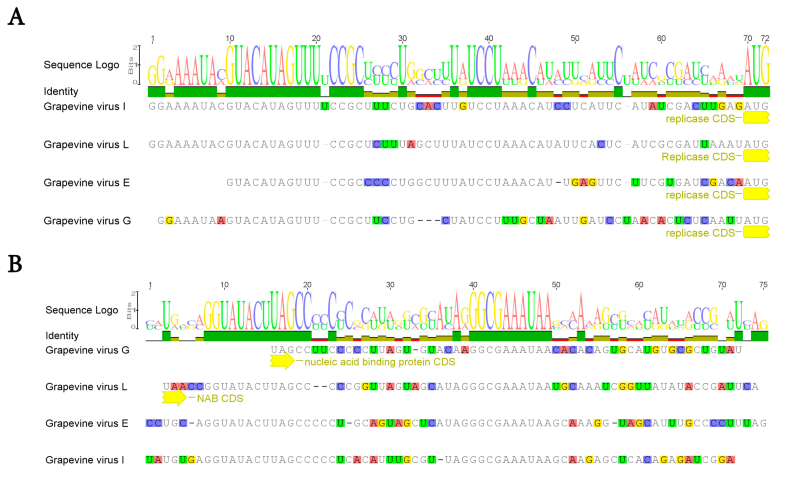 The detected virus sequence is 7607 nt long, including a typical genome organization of ORFs encoding a replicase (RP), a 22 kDa protein, a movement protein, a coat protein (CP) and a nucleic acid binding protein. 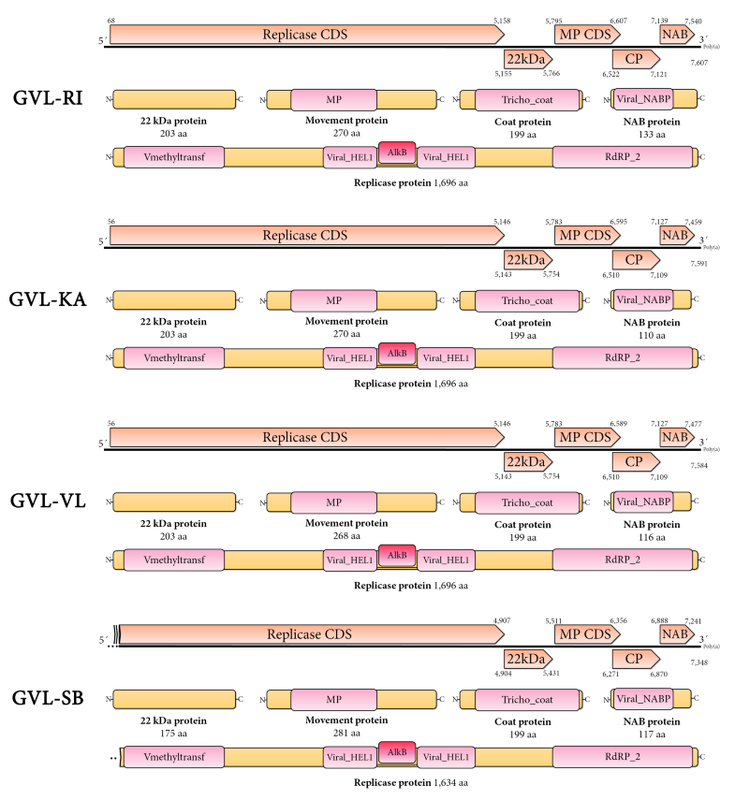 Phylogenetic analyses based on the predicted RP and CP proteins unequivocally place the new virus within the Vitivirus genus. 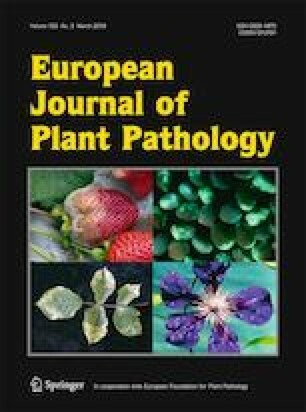 Multiple independent RNAseq data confirmed the presence of the detected virus in berries at diverse developmental stages. 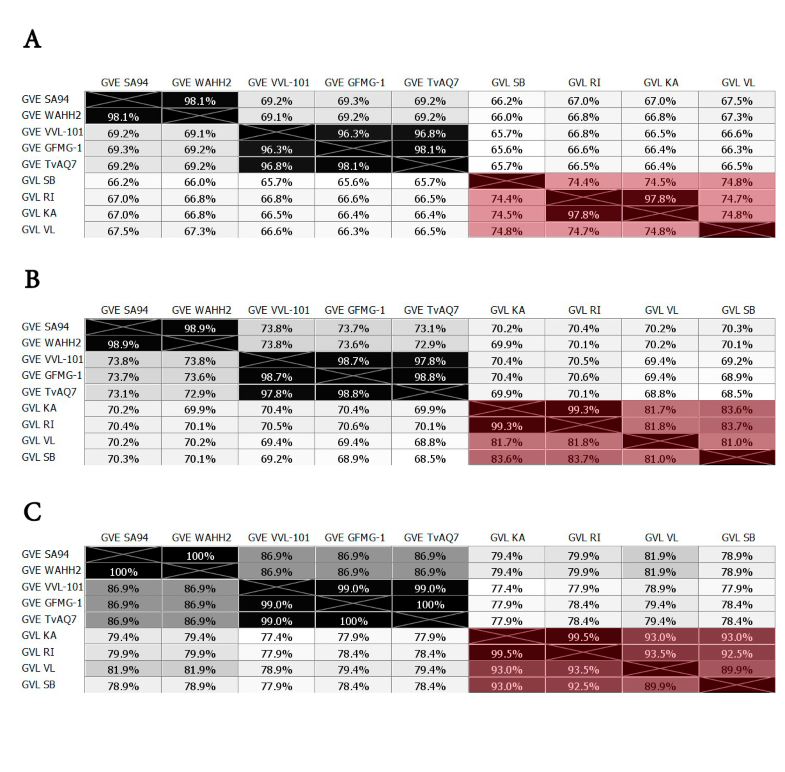 Additionally, we detected, confirmed, and assembled virus sequences from grapevine samples of distinct cultivars from America, Europe, Asia and Oceania, sharing 74.4%–97.8% nt identity, suggesting that the identified virus is widely distributed and diverse. We propose the name grapevine virus L (GVL) to the detected Vitivirus. Humberto Debat and Diego Zavallo contributed equally to this work. The online version of this article ( https://doi.org/10.1007/s10658-019-01727-w) contains supplementary material, which is available to authorized users. This work was supported by project PE1131022 of the Instituto Nacional de Tecnología Agropecuaria (INTA) and by ANPCyT PICT 2015-1532 and PICT 2016-0429. The funders had no role in study design and analysis, decision to publish, or preparation of the manuscript. The research from New Zealand is funded by New Zealand Winegrowers Inc. and The Ministry of Business, Innovation & Employment. Many thanks to Alfredo Diaz Lara, Department of Plant Pathology, University of California, Davis, CA for his technical assistance. HD, DZ, SGT and SA designed the study. RSB, DV, RPPA, AGB and MAR, performed experiments, generated and analyzed data. 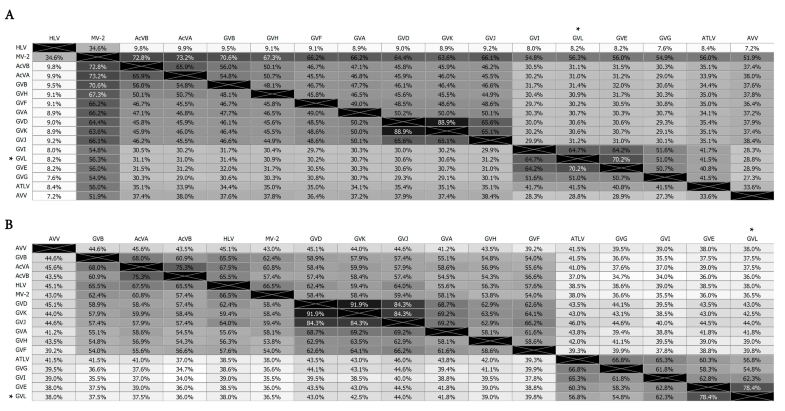 HD integrated the data together with SA. HD and DZ wrote the initial draft of the manuscript and SGT, AGB, RSB, DV, RPPA, MAR and SA revised the manuscript. All authors approved the final version. This article does not contain any studies with human participants or animals performed by any of the authors. Therefore, informed consent was not required for this work.